Here they are in all their dirty, messy haired, were just outside playing, glory. Wearing their bumGenius diapers. I wish I were able to say that my kids have always been in cloth, but really, I can't. They wear disposable diapers at night, and when we take overnight trips, and often times when we go out for errands. I'm not the cloth diapering mama I wish I could be. I've been especially plagued by the fact that I don't use cloth at night. I've read through diaper forums looking for solutions, but haven't been satisfied. Elizabeth wore cloth diapers at night up until about 1 year old. I usually had her in a bumGenius onesize pocket diaper, stuffed with two regular microfiber inserts. I've never really struggled with having enough absorbency in the diapers over night. The problem I encountered was ammonia build up. The Stinkies. When E would wear her diaper for an extended period of time, when I took off the diaper, the ammonia would burn my nose and eyes from a few feet away. You can imagine that her skin in close proximity for extended periods of time would be red and hurting. She started sleeping poorly at night, waking several times fussing. I tried different washing solutions, but never came up with something that eliminated the ammonia from the microfiber inserts. Over the past 2 years, I've made a couple of attempts to get the kids back into cloth for night time. Generally, I found that whenever I tried putting Elizabeth back into cloth at night, she would fuss, and not sleep as well. Nathanael has almost always been in disposables at night, and was actually in disposables for about the first 8 weeks of life, because I was trying to resolve diaper issues that I thought were related to the elderly bumgenius diapers I was using at the time. Even when I got the new diapers, I didn't put him in cloth at night, which I think was mostly habit. One interesting observation from an experiment about 6 months ago: Sometimes the stink might have more to do with the age of the child than the fabric. 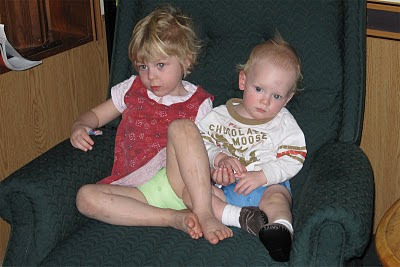 When I put both kids in the new bumGenius pockets and inserts one night, E still woke up with awful ammonia smell. N woke up with just a hint of ammonia. Same diapers, same wash procedure. Different body chemistry for each child. Toddler pee can be a yucky thing. So, here I am, when my daughter is starting to potty learn and my son is a year old, trying cloth diapers at night. I think I'll only try to put N back in cloth at night, however, as E is almost too big for the onesize diapers, and when they are stuff for nighttime, they become uncomfortably snug in the crotch. Stuff the BumGenius pocket diaper with a cotton prefold, instead of microfiber. Wash the covers separate from the absorbent part. The theory here is that the waterproof covers aren't allowing the diapers to wash and rinse as thoroughly. Wash natural fibers separate from the synthetic fibers. Some people feel that the natural fibers can leave some of their natural oils in the microfiber, which can impact performance. Try something strong, like oxyclean, bleach, or other additive to the microfiber only. I'm cautious about this, as if things aren't rinsed thoroughly, additives could get into my other diaper fabrics, which could cause problems. Additives can void the manufacturer's warranty. Although, I'm just a few months shy of the warranty limit, anyway. I have considered using only natural fibers for night time - cotton and hemp for absorbency, and a wool cover. I know many parents wouldn't night time diaper without them. I'm concerned that my children might fuss about having a wet diaper next to their skin all night. They fuss as it is. I would guess they might fuss more, which is not the direction I want to go. I wish mommy would cloth diaper my little bottom!